Last week, we read the importance of making wedding traditions your own, and this week, we have some awesome examples from lead local Hampton Roads wedding professionals and some pretty creative couples here in Hampton Roads to help inspire you for your own wedding days. 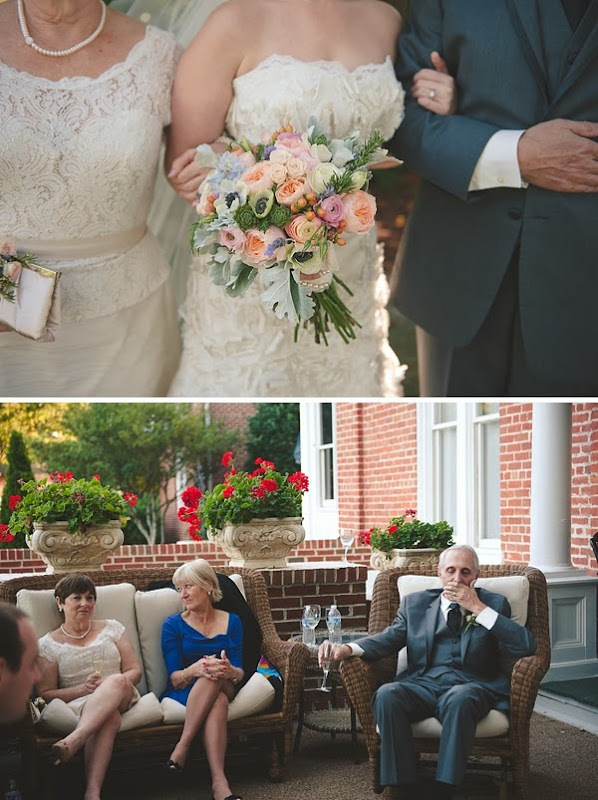 One recent wedding we had was for a beautiful, fun-loving couple. Ashley and Nick's favorite dessert was the Mozart Cake from Sugar Plum Bakery (which is truly to die for! ), so they decided this was the must-have for dessert at their wedding. To stay on budget, instead of having to have a big cake to feed 75 and centerpieces for 8 tables, Ashley came up with the brilliant idea to have individual Mozart Cakes as the centerpieces. Each cake was decorated differently and made for a gorgeous centerpiece, plus later in the evening, the guests got to enjoy what they had been eyeing all night! Ashley and Nick's cake table consisted of beautiful flowers, candles, and a 6" cake of their own to cut and savor - it could not have been more perfect for them. My very favorite "reinvented" tradition at a wedding is the private last dance. It is my absolute favorite dance that can be had; and it's a tradition in the Antonia Christianson Events Family. It's a fantastic time for our couples to enjoy each other, for a few final moments, and to savor the day. It usually works great while the guests exit the venue to get ready for the grand finale exit of the happy couple...the couple take just a few minutes to have this dance. It's a fun twist on the first dance. Only it's private, and romantic, and perfect. (what's the nice way to say, we kick everyone out so it's only the band, photographer and couple). Instead of tossing her bouquet, my bride dedicated and gave her bouquet to her parents as a thank you for all of their love and support. What made it even more special was that she was married on her parents' anniversary. There weren't any dry eyes from that! We have a 2015 couple that's going to add a different element to their ceremony. Since they're both self-proclaimed geeks (she's a nurse and he's really into comic books), instead of a sand ceremony, they're going to each pour a "love potion" into a graduated cylinder. And to keep the theme going throughout the day, they're also going to use graduated cylinders and beakers instead of traditional vases for the centerpieces. It's such a cute idea, especially for the two of them, and I can't wait to see it all come together! I love the updated spin on the unity candle with the "tying of the knot"-- very literal and nautical for this area. 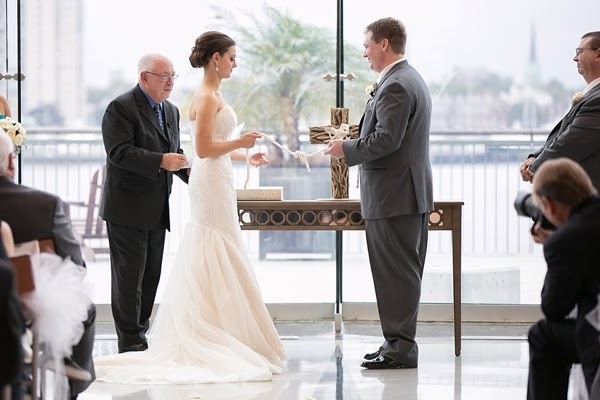 The wedding ceremony of Morgan and Austin this past October 2013 at the Half Moone Celebration and Cruise Center shows this beautifully. And can I say, stunning bride!